In the summer of 1992, Fabio Capello and AC Milan found themselves within the enviable situation of trying to improve upon perfection. The previous season, domestically at least, had been word-perfect for AC Milan. While they might have been nursing a one-season ban from European competition, in Serie A they swept to the title without a loss. As first full seasons in football management go, Capello’s debut campaign was astounding. Inheriting an already remarkable side from his predecessor Arrigo Sacchi, Capello had tweaked minimally. 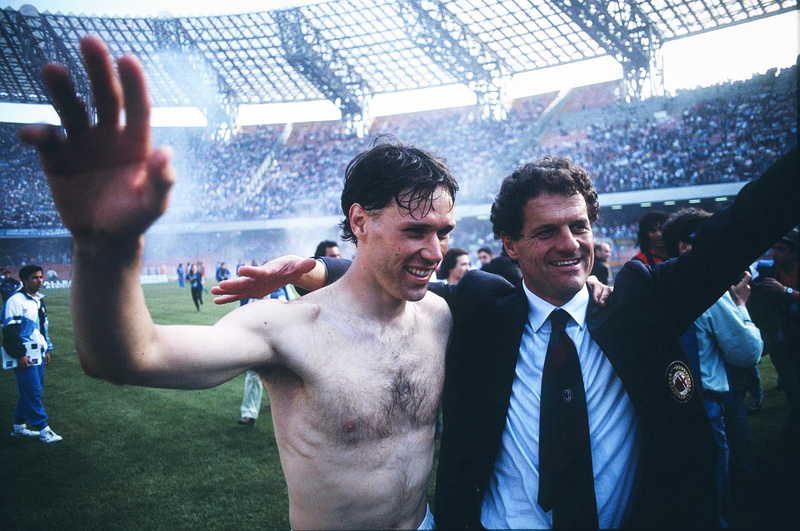 Demetrio Albertini had displaced the ageing and injury troubled Carlo Ancelotti, but beyond that, Capello had stuck to Sacchi’s winning formula. Still within the era of two points for a win, AC Milan took the title by eight points. Juventus, starved of the Serie A title for six years, were runners-up. In the summer of 1992, Serie A was still the undisputed playground of the good and the great of world football. It was also reaching its supernova when it came to a rich era of widespread competition. Between 1983 and 1991 Roma, Hellas Verona, Napoli (twice) and Sampdoria had all managed to wrestle the Scudetto away from its usual cities of residence: Milan and Turin. Even Milan, as a Serie A-winning city, had fallen into decline during the early to mid-1980s, rising once again as the decade drew towards a close. For AC Milan’s Dutch powered model of Ruud Gullit, Marco van Basten and Frank Rijkaard, Inter Milan could boast the Germanic enhanced vintage of Lothar Matthäus, Jürgen Klinsmann and Andres Brehme. Through it all, Juventus had remained the one true constant. Well, until the end of the Michel Platini years at least. As the unfashionable clubs of Rome, Verona, Naples and Genoa suddenly became fashionable, and the Milan’s of both red and black and blue and black denominations arose from their slumbers, Juventus lost their Midas touch. While 1985/86 might have felt like business as usual for the Old Lady, it had in reality been the end of an era. It was their last Scudetto for nine years. Juventus failure during that time wasn’t down to a lack of talent, and neither was it down to a lack of investment. Juventus simply could not get the chemistry right. Even the acrimonious and world record arrival of Roberto Baggio from Fiorentina in 1990 could not help them reclaim the balance of power. The unbeaten AC Milan of 1991/92 essentially marked the coronation of the new kings of the Italian game; a club which now seemed to be consuming their homeland, just as it had Europe when the 1980s passed into the 1990s. While the summer of 1992 saw the dawning of the Premier League, it was Italy where the shots were still called the loudest. As Alan Shearer was becoming the costliest player to move between two English football clubs at £3.6m, AC Milan and Juventus were fighting it out for the signature of a player whose transfer fee would set them back almost four times that amount. A new world record fee was about to be set, but not just that, this was a very defined flexing of muscle between the new and the old alpha-males of Serie A.
AC Milan and Juventus had already traded transfer punches that summer. While the Rossoneri became the first club to break the £10m barrier during their purchase of Jean-Pierre Papin from Marseille, the Bianconeri responded in kind when they ploughed past that fee by splashing out £12m on Sampdoria’s Gianluca Vialli. With the world record transfer fee already having been broken twice in a costly trilogy, the same two clubs fought it out for the right to break it yet again. This time, Torino’s Gianluigi Lentini was the target. Whereas the signings of Papin and Vialli, two of Europe’s most feared marksmen, had been seen as expensive but sound investments, the pursuit of Lentini was very much an act of one-upmanship and vanity. While Juventus faced an aesthetic struggle to sign their city rival’s star player, their interest was more than a mischievous one designed to drive up the price for AC Milan. No stranger to controversial signings, Juventus meant business. From Torino’s perspective, Juventus’ interest was simultaneously welcome and unwelcome. While Torino couldn’t countenance Lentini wearing black and white stripes, the fact that Juventus were interested in him drove his value beyond its natural level. Aged 23, Lentini, a mercurial winger who could operate down either side of the pitch, wasn’t yet the finished article. He may have been a full Italian international but he was still more a vision of potential than a polished world beater. His £13m price-tag and the title of being the most expensive footballer in the world didn’t sit easily for anyone. Italy’s scrutineers in the sports press were aghast at the perceived money-train raging through Serie A, while the Vatican itself took a hard-line by branding the transfer fee “an offence to the dignity of work”. Lentini was widely admired in Italy, yet remained largely unheralded globally. The Azzurri failing to reach the finals of Euro 92 went a long way in ensuring this was the case. Lentini was denied the opportunity to showcase his talents to a watching world, in the way Roberto Baggio had been gifted two years earlier when he found himself in a similar situation. AC Milan cared little for these issues and they pressed ahead with their clinching bid. Lentini was to leave Turin for Milan. Fabio Capello’s unbeaten side was being given fresh impetus. As irate Torino fans rendered the club president, Gian Mauro Borsano, a near-prisoner of his own home due to the sale of Lentini, it was arguably the concept of a potentially great team being broken up, rather than the sale of one individual component, which drove Torino’s fans to the streets in protest. Lentini had been away from Torino on loan to Ancona as recently as the 1988/89 season. While he’d been assisting Ancona in preserving their Serie B status, in his absence from Torino they’d narrowly slipped to relegation from Serie A. The 1989/90 season, leading up Italia 90, was spent helping Torino return to Serie A under the Serie B promotion specialist, Eugenio Fascetti. Once they were back in Serie A, Lentini became an integral part in a two-season eye of the storm under the leadership of Emiliano Mondonico. A highly credible fifth-place finish in 1991, inclusive of defeating Inter Milan at home and beating Juventus in the ‘away’ Turin derby brought UEFA Cup qualification. In March 1991 Lentini made his debut for the national side. By 1991/92, Mondonico had assembled a side that looked capable of following in the footsteps of AS Roma, Verona, Napoli and Sampdoria in challenging for major honours. Alongside Lentini was Luca Marchegiani, Pasquale Bruno, Roberto Mussi, Luca Fusi, Roberto Policano, Giorgio Venturin, Rafael Martín Vázquez, Enzo Scifo, Walter Casagrande and the emerging Christian Vieri. As AC Milan swept to the 1991/92 Serie A title without a loss, Torino continued to show signs of real intent, finishing third and reaching the UEFA Cup final, inclusive of overcoming Real Madrid in the semi-final. Up against Louis van Gaal’s Ajax, both legs of the final were blessed by prolonged periods of open and attacking football from both sides. In the first leg at the Stadio delle Alpi, Torino twice came back from a goal down to eventually draw 2-2, Casagrande scoring both of Torino’s goals, the second of which was laid on to him by a beautifully weighted through ball from Lentini. In the return game at the Olympic Stadium in Amsterdam, Torino were denied by the frame of the goal as much as they were by Ajax. In as open a goalless draw as you could wish to see, Torino twice hit the post and also hit the bar in the dying seconds of the game. Lentini was again central to most of Torino’s best moves, but the UEFA Cup was to belong instead to Ajax. Eleven days later, Lentini played his last game for Torino prior to the auction for his signature beginning. He scored the last goal in a 5-2 victory over Ascoli in front of his adoring audience at the Delle Alpi. The repercussions of Lentini’s switch to AC Milan have long been lost behind the mystery of the car crash which almost killed him in August 1993. At high speed, on the outskirts of Turin, Lentini lost control of his yellow Porsche 911. Being flung from the wreckage almost certainly saved his life. The crumpled shell of his car strikes a startling image. It was an incident he had no right to survive. In a split-second, the landscape of Lentini’s life changed forever. After a debut season at the San Siro which had brought him a Serie A title win and a lost Champions League final, the world had seemed to be at Lentini’s feet. He had fluctuated in form, swinging from the sublime to frustrating, often within the span of the same game. Enough had been seen, however, to believe that greatness could be his. From a run of unexpected Serie A champions challenging the popular convention of the scudetto always residing in Turin and Milan, Serie A has only twice been won by clubs other the Juventus, AC Milan and Inter Milan during the last quarter of a century. The gap which had narrowed during the second half of the 1980s had been reopened to near unbridgeable proportions with that trio of record-breaking transfer fees in the summer of 1992. The playing field tilted dramatically. Lentini was of course never the same player again. That he managed to return at all was a miracle in itself, and he was an unused substitute at the Olympic Stadium in Athens in May 1994 when Capello’s AC Milan dismantled Johan Cruyff’s Barcelona Dream Team. Lentini remained with the club until the summer of 1996, appearing sporadically and never being anything other than an optional extra, picking up more winners medals along the way. The effortless balance which was once his trademark, along with a will to dribble the ball, was now largely lost to him. A semi-regular blurring of vision and memory retention problems robbed Lentini of his power spontaneity. It seemed fitting that as Lentini left AC Milan, Torino simultaneously slipped to relegation from Serie A once again. His old club had lifted the Coppa Italia in 1993, but then fallen into regression. In 1996 still aged just 27, Lentini again teamed up with his former Torino mentor Mondonico, this time at Atalanta. Linking with the burgeoning talent of Filippo Inzaghi, Lentini started out impressively, even gaining a recall to the national side, but ultimately offered only flickering glimpses of the player he used to be. 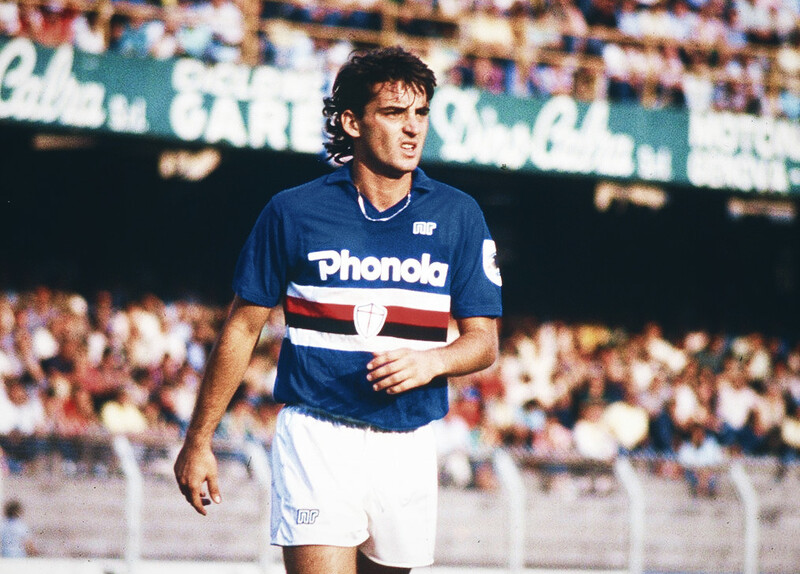 His time with Atalanta would stretch no further than one full season, but he helped them to a comfortable mid-table finish, avoiding their regular flirtation with relegation. On his departure from Atalanta, Lentini made an emotional return to Torino, with the club still marooned in Serie B. A near miss on promotion in 1997/98, losing out on penalties in a promotion play-off, was remedied the following season when he helped the club to a runners-up spot behind Verona and a return to Serie A. Mondonico was the coach who brought Lentini to life once more. Torino and Lentini both struggled with the step back up to the Serie A, however, and relegation was a bludgeoning experience. In the summer of 2000, Lentini departed Torino for the final time, joining fellow Serie B side Cosenza, which allowed him one more return to the Stadio delle Alpi as a visiting player. Lentini, widely seen as a footballer unfulfilled, proved to be a man who struggled with the idea of letting the game go, continuing to play for a string of lower league clubs inclusive of ASDC Canelli alongside another former Italian international in Diego Fuser. It was one of the most enjoyable periods of his career. He played out his final games at his home town club Carmagnola, retiring at the age of 43, a full two decades on from becoming the most expensive footballer in the world. He still turns out in charity and exhibition games on a regular basis and with no interest in a coaching career; it is his son Nicholas who continues to carry the Lentini name at professional levels, as a goalkeeper rather than a winger like his father. For four seasons Gianluigi Lentini tormented opposing defences on a weekly basis. Propelled into becoming the most expensive footballer in the world, it all came to him a year or so too soon. It was a move which changed football more than it is ever given the dubious credit for. He was a brilliant footballer but he was nowhere near being the best player in the world. A car crash at high-speed took away from him the opportunity to prove he could become that player, however. That car crash and that transfer fee will forever shield the player he was and the player he could have become.